Earlier this year, PMG, a provider of business process automation software, and Arketi Group brainstormed PR strategies to help the company capture more industry mind-share and media attention. The joint team developed numerous approaches, and settled on the idea of a thought-leadership survey campaign that would focus on a major concern of its target audience, IT professionals: the proliferation of cloud solutions in the enterprise. Building on key industry recognition from Gartner at the end of 2012, the team recognized the survey’s potential as the springboard for an aggressive PR push in 2013. Working closely with PMG’s marketing and executive team, Arketi crafted a research premise for the survey that reflected their business objectives. Using Arketi’s survey campaign methodology, the team performed a literature review to see what research had already been conducted on the survey topic: how cloud applications and services are making their way into the enterprise with and without IT approval. The team carefully evaluated the tone and frequency of “cloud” discussions in the IT community and identified “cloud sprawl” as a growing trend that could be leveraged. With this knowledge in hand, a survey instrument was constructed and fielded to thousands of corporate IT professionals across North America. In return for completing the questionnaire, respondents were offered a copy of the survey findings — a great opportunity to benchmark oneself to one’s peers. At the sixth annual Technology CMO Roundtable, 78 percent of attendees said they plan to maintain or increase their thought leadership activities in 2013. View here. Survey campaigns are a great way to develop a thought leadership platform and garner media attention. To see what other strategies marketers are prioritizing this year, click here.. Within a few days, a statistically significant number of responses were received, and analysis of the results could begin. As the findings emerged, the Arketi team identified target media and pre-pitched the survey results, successfully garnering early interest in the survey results from major publications such as Baseline, Forbes and InfoWorld. A survey findings news release was developed, along with a FastFacts report that visualized the key results in a colorful and easy-to-digest format. Included in the news release was a link to a landing page where the full report could be downloaded. Once the news was released, aggressive media outreach and follow-up continued over the next eight weeks. In addition to a healthy dose of tenacity on the media relations front, PMG’s marketing automation savvy was also put into action to support the campaign. The survey positioned PMG as the authority to discuss the importance of controlling cloud sprawl within the enterprise, and provided an opportunity to explain how its service catalog technology can be extended beyond the IT department to tackle business issues. Sometimes it may seem as though setting the marketing budget is little more than a game of chicken. But with the right approach, budgeting can be a strategic tool for driving business. 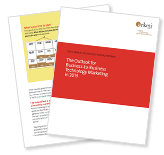 For more on bulletproofing your marketing budget, download the free Arketi Insights paper. The technology community in Georgia experienced a new kind of March Madness this year when the Technology Association of Georgia and Arketi Group launch the 2013 State of the Industry website and the Technology Tweet Tournament. Read the BtoB case study. To date, the campaign has generated tremendous media coverage, successfully positioning PMG as an expert on a topic that is top-of-mind with many enterprise IT professionals today. The media relations effort has secured nearly three million media impressions across a &ldquowho’s who&rdquo of the tech media including Baseline, CIO, FierceCIO, Forbes, InfoWorld and TechRepublic. Email marketing campaigns and social media efforts continue to drive downloads of the survey report, and its results are also used as content for webinars and speaking engagements. PMG also distributes a printed version of the report at tradeshows and during the early stages of the buying process. “Thought leadership is something everyone is seeking these days and having the technology chops — even when validated by an industry analyst firm like Gartner — is not always enough to break through the excessive marketplace noise,” said Melinda Champagne, director of marketing for PMG. Click here to see the visual elements from the 2013 PMG Cloud Sprawl Survey. Thanks for reading Core. If you liked “Together, We Did It: How Arketi Client PMG Used Survey Data to Drive Thought Leadership,” please share it on Twitter. Or, if you’re interested in learning more about Arketi’s survey campaign methodology, contact Mike at mneumeier@arketi.com or 404-929-0091 ext. 210.